Here I am, trying to ignore the elephant in the room again (ie the not blogging). Honestly, I write blog posts all the time in my head, I just forget to actually, properly write them….and to take photos. Oh well. The garden is ticking along nicely, although it’s wilting in the high temperatures we’ve been getting here in the South. I was lucky enough to be taken to Hampton Court Flower Show last week. I’d love to write lots of fabulous things about it but the honest truth was we spent most of the day complaining, like true Brits, about how hot it was. 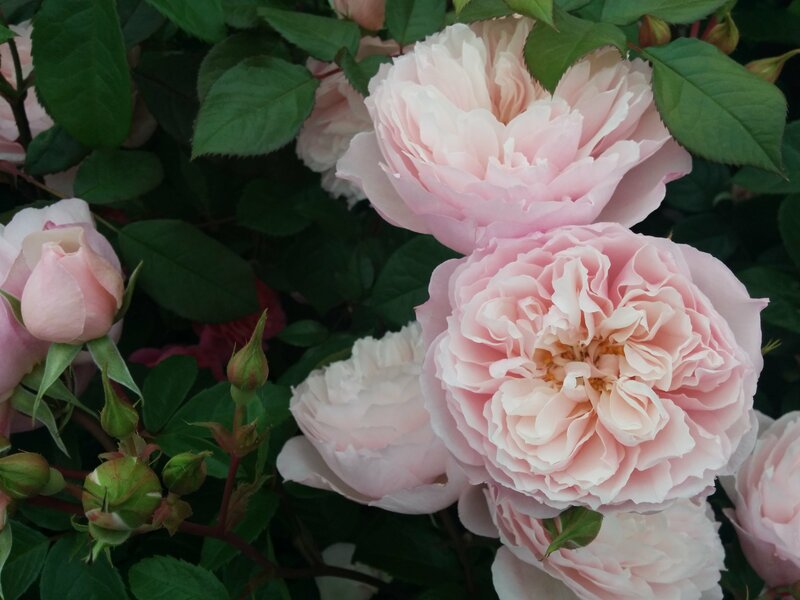 We rushed through the Country Living tent, stopped briefly at the roses (the only photos I took, and on my phone), dashed (or in our case, slowly dragged our sweating bodies – nice!) past the show gardens before relaxing in the Allium Restaurant with its air conditioning for lunch, and attempting not to stare at the poor lady who had collapsed in the heat, and was being attended to by St Johns Ambulance. We then stepped back outside into tropical temperatures, decided we were too Northern in blood to cope and went home. I did buy gin though and some AMAZING pies from Simple Simon’s Perfect Pies that were the best pies ever. In the garden the fruit is ready to go. I managed to steal some of the cherries from the birds and mice for the first time in years, they could have done with a few days longer, but I know the pesky pigeons will strip them in an afternoon, just as I’m about to pick them, as that always happens and I decided not to wait. The variety is Lapins and I planted the tree when we moved here after also planting the same variety in our old garden and being amazed be the fruit flavour. There are alpine strawberries, pink gooseberries, blackcurrants and soon the redcurrants will be ready. In the veg patch I have lettuce, spring onions, peas, spinach, chard, radish, courgettes, beetroot and I’m sure lots more that I can’t remember right now. Although I don’t have any photos to pretty this up, I have discovered the most amazing recipe for ice cream and wanted to share. It came about as I had a jar of lemon curd as a freebie and I wanted to use it up as it’s been in the store cupboard for months. The recipe is pulled from a number I found on-line and merged together to work for me and what I had in at the time. I usually make a custard base for my ice cream but I enjoyed this method and taste so much, I’m going to adapt my usual Blackcurrant Ripple to something similar. It’s all a bit taste as you go along and alter, but I found that the exact amounts didn’t matter too much (ie I think I might have used more like 250ml yoghurt as my cartons come in 125 each). Pop your ice cream maker in the freezer as per its instructions (mine needs to go in the day before). Whip the cream. Fold in the yoghurt, just over half of the lemon curd and then add the lemon zest and honey. Taste and add the lemon juice and check it tastes nice (add more honey or extra lemon juice, if you like). Gently pour into your ice cream maker. Once it’s nearly ready, tip in your gently broken up meringues or fold them in by hand just before putting your ice cream into a freezer container. As my ice cream maker produces quite a sloppy mix, I pop it in the freezer at this point and then once it’s stiffened up a bit, I swirl through the rest of the lemon curd. If I add it when it’s too soft, it just sinks to the bottom of the container. There is always the chance I forget this last stage, then you don’t get those delicious swirls of sherbety lemon curd running though the ice cream, which is a bit of a bummer.. The boys have declared this the best ice cream yet so that says it all! I’m off to visit Hever Castle today so no doubt it’ll rain all day for the first time in weeks. Still, I’m really looking forward to a day chatting with friends and imagining Anne Boleyn strutting her stuff in the rooms.